Last night at dinner time Mark was making some homemade chicken kievs (that where delicious I must add), anyway we had a little bit of raw chicken breast left, what to do with it? My thinking was “What a great treat, let’s give it to the dogs”. Mark agreed as dogs are supposed to eat raw meat, as they would in the wild. To my surprise Bunk wasn’t very interested. He sniffed it and licked it but that was it, he just looked at me as if to say “Any chance you could roast that for me, maybe a bit of garlic or just some herbs…”. As for Lilly she didn’t even come close to it, looking like we were trying to poison her! I really thought it was weird. It was fresh, good quality chicken breast. Ok, it was raw but I never heard about Cordon Bleu dog restaurants and master chefs or even fussy pooches Lilly is a Labrador they would eat their back leg if they go more than a couple of hours without something to eat… I thought they will enjoy it, how wrong was I? Do your pets eat raw meat? I don’t think we have ever tried to give them anything raw before; I just want to know, was it chicken they did not like or the fact it was raw? Or are they just a pair of spoiled brats…. Hungry on the new diet? i’ve been hearing about the raw meat diet because they say it’s more beneficial, but i agree with rumpydog because we really are not sure of what hormones are being fed to the animals.. my kitty Star is (i think) not interested as she eats on top of the kitchen where the raw meats are when i’m cooking but she didn’t even try to lick them or taste them..
We don’t eat raw meat because here there are many hormones and antibiotics given to animals used to feed humans. We’d have to buy from a local farmer that doesn’t use them and that gets expensive. We do sometimes get a dehydrated food that is made of raw meat. So it’s not technically raw, but pretty close. the brand we feed is called The Honest Kitchen. Well my dogs love raw meat cut up. My cat hates raw meat. So I think it is down to what they know as both boys were street dogs but that cat been here their whole life. Could simply be that it was unfamiliar food. 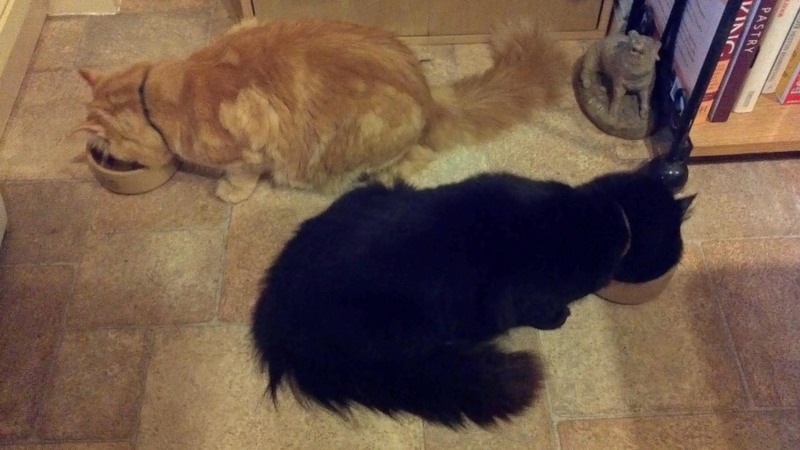 Not having been fed it before, they were suspicious. Of course, had they found it next to a dustbin in an alley, they might have been different! Chicken or all raw meet? We tried it with beef, maybe the reason was that he wolfed it down in a second.